Want to be notified to turn on the AC when a room reaches a certain temperature? Or when your laundry’s done? Well MIT Media Lab alumni Supermechanical have built Twine, a sleek 2.5″ rubber square which connects to Wifi and allows objects to “communicate” under certain conditions. 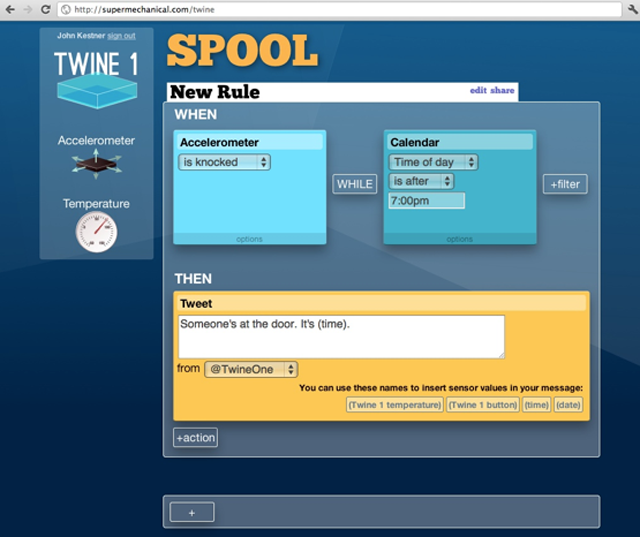 The Twine, which reminds me of a Square from a design simplicity perspective, comes with a web app, ‘Spool’ which allows you to program its sensors with natural language rules like “When: accelerometer is at rest, Then: Tweet” in the case of the laundry done thing, for example. You can hook up the battery operated Twine to communicate through SMS, Twitter, Email and even HTTP requests if you’re into that sort of thing. The basic Twine comes with an internal temperature sensor and an internal accelerometer, and the Twine guys are making optional external sensors including a magnetic switch for doors, a moisture sensor and a breakout board for those of you that want to create your own DIY sensor action. Supermechanical says that it will develop additional sensors for every $10K over its Kickstarter funding goal. Possible options include an RFID reader, a pressure sensor and/or current sensor. After a stint on Hacker News, the project has received over $60K in funding, and with a donation of $90 you can order your own Twine through Kickstarter — A perfect gift for the person who has everything but a refrigerator door with its own Twitter account.